Rose Park is a neighborhood located in the northwest area of Salt Lake City, Utah and is among the most ethnically diverse areas in Utah. Its name comes from the area's original developer, who arranged part of the area's streets in the shape of several roses, with one of its main streets, American Beauty Drive, acting as a long rose stem. This area's original roof shingles were red or green and its street names all feature rose varieties. Rose Park residents enjoy a very short commute (less than 5 minutes) to downtown and many recreational amenities. The Rose Park community is very small. It is defined as west of I-15, north of 600 North, and east of Redwood Road. Rose Park extends north to the city limits and the shared county line of Salt Lake and Davis Counties. Four stone signs welcome travelers through Rose Park on major streets, like this one found at the intersection of the Jordan River trail and 1000 N. The original boundaries of the historic Rose Park development are easy to identify by these four signs which generally mark the four corners of the original neighborhood. It's also easy to identify by paying close attention to style of 1950s-era home construction in that neighborhood. Rose Park lies north of the Fair Park Community and Glendale neighborhoods and west of the northwest slope of Capitol Hill. The media often portrays the entire urban area west of I-15 as Rose Park but its actual boundaries are relatively small. The entire neighborhood falls within the boundary of West High School, one of Utah's largest and the oldest high school. 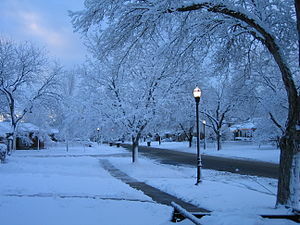 The Rose Park neighborhood lies within the Salt Lake City School District and contains three elementary schools: Rose Park Elementary, Backman elementary, and Newman Elementary. The Salt Lake Center for Science Education, a charter school within the Salt Lake City School District, occupies the building and grounds of the former Northwest Middle School which moved to a new, larger location outside of the neighborhood in 2006. In the 1940s and 50s, Rose Park was marketed as a reasonably priced division with larger plots than older Salt Lake City neighborhoods like the Avenues. After World War II, population and growth in the area increased as vacant plots were bought up and homes built. Like the early residents of Murray, many were non-Mormon blue-collar workers, although Rose Park's laborers worked for railroads instead of smelters. More recently, one can find accountants, electricians, business managers, engineers, real estate agents and brokers, architects, and police officers among Rose Park residents. Many homes are now being renovated by young families who have moved into the area. It is one of the only neighborhoods near downtown Salt Lake City that is still affordable to first-time home buyers (estimated $170,000-$300,000). The homes are small by today's standards (averaging 1,600 to 1,800 square feet) and are generally constructed of brick though some early stick framed homes are present in the area. Trees (including many varieties of fruit trees) were planted in the neighborhood by young WWII era families. Rose Park now boasts some of the city's largest and most densely spaced trees. In the early 1980s a hazardous site existed near Rose Park near Rosewood Park and east of the Rose Park Golf Course. The state of Utah petitioned the United States Environmental Protection Agency to add it to their list of Superfund cleanup sites. The agency agreed and in 1982 it was added to the Superfund list as "Rose Park Sludge Pit." Local refineries dumped waste products in the sludge pit from the 1930s until 1957. The acidic sludge contained carcinogenic polycyclic aromatic hydrocarbons and sulfur dioxide posing a threat to groundwater and surrounding organisms. This was particularly unnerving because much of the municipal water in Rose Park comes from scattered wells Though no contaminants were ever detected, the threat of contamination was enough cause for action. Amoco oil company was potentially liable for the site and agreed to clean it up in 1985. The solution entailed the construction of a slurry wall around and under the sludge pit to avoid groundwater contamination. A clay cap was also placed on top of the sludge pit and topped with grass. Since these improvements, the contamination site has passed all of its five-year reviews with the solution deemed "protective of human health and the environment." No additional threats have been identified. For the last several decades, Rose Park has suffered from a negative reputation. This perception may be rooted in the media's frequent portrayal and misunderstanding of Rose Park's location. Rose Park is often confused with Glendale, Fairpark and other west-side communities of Salt Lake City. Crime reports are published monthly by the Salt Lake City Police Department. "District 1". Salt Lake City Police Department. Archived from the original on 2011-01-10. These reports show that Rose Park has a rising crime rate for Salt Lake City. Similar to any other community of Salt Lake City, crime is being aggressively targeted by the Salt Lake City Police Department. The neighborhood is one of the most religiously and ethnically diverse areas of Utah. The most recent data shows residents in the neighborhood are 53% Caucasian/European 37% Hispanic 4% African American and 2% Polynesian and 4% other/unspecified. This information supports a trend seen in the real estate industry of young professionals of primarily European descent purchasing homes in the area. The same trend was observed in nearby Sugarhouse in the late 1990s as individuals not willing to commute for long hours sought out affordable housing near the Salt Lake's city center. Rose Park benefits from an active community council. The Rose Park Community Council is made up of an elected body of volunteers who serve the interests of Rose Park and the community. The purpose of this council is to provide community input and information to various city departments. Community councils are encouraged to make recommendations to the city on all matters affecting the city or each organization's particular community or neighborhood. The council holds a monthly meeting, to which the public is encouraged to attend, the first Wednesday of each month, at 6:30pm, in the Day Riverside Library (located at 1105 W. 1000 North). Several small, family-owned restaurants and stores. Easy access to I-15, I-215, and the Legacy Highway. ^ "Detailed Description of the Records". University of Utah. Archived from the original on 2008-02-12. ^ McKane, Scott (2015-11-26). "Turkey Bowl pits Rose Park against Glendale while promoting peace". KSTU. ^ "Best of Utah 2010: Rose Park". Salt Lake City Weekly. 2010-04-07. 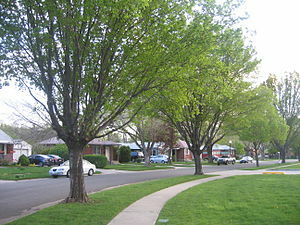 Wikimedia Commons has media related to Rose Park, Salt Lake City. This page was last edited on 8 October 2018, at 15:04 (UTC).